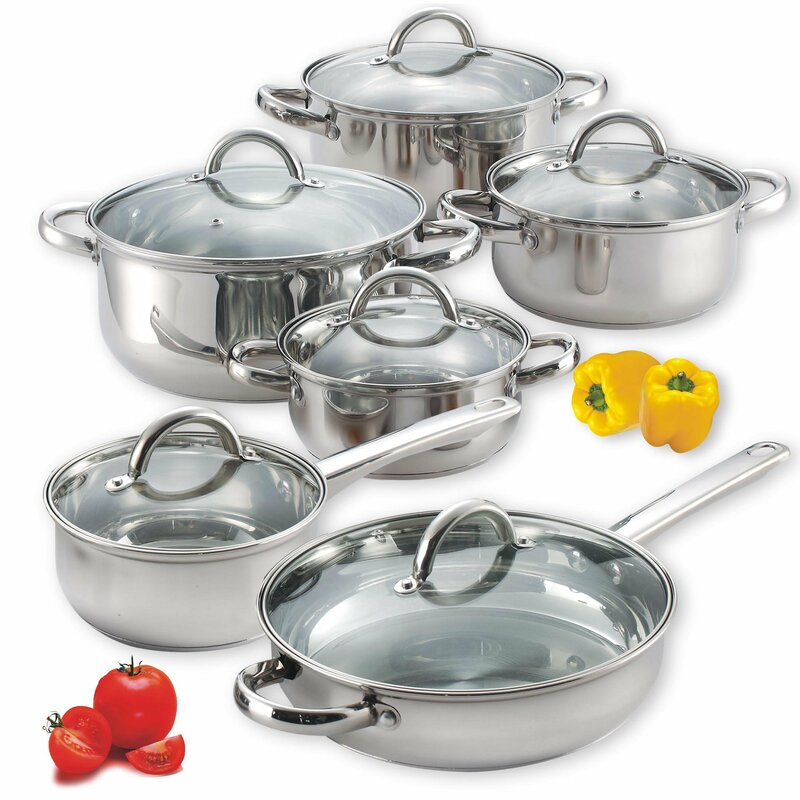 Stainless steel is a very popular choice for cookware sets. There are several reasons for this including the durability of the metal, which is very resistant to dings, dents and scratches. Another huge plus for stainless steel versus other metals is that it is non-reactive to food while cooking. Simply put, this means that your food won’t be altered in smell or taste when using stainless cookware. Unfortunately, a stainless steel cookware set can include a hefty price tag. However, I’ve found 5 stainless steel sets – all under $100! The Wearever Cook & Strain Stainless Steel Set includes 1 and 2 quart covered saucepans, a 5 quart covered Dutch oven, and a 9-1/2″ saute pan. Accessories include a spoon, slotted spoon and slotted turner. The pots, pans and tools have convenient loops at the ends of the handles for hanging storage. The Wearever Cook & Strain Set has 18/10 stainless-steel construction both inside and out, with an aluminum base for quick and even heat distribution. Features include rolled, stay cool stainless steel handles and tempered glass lids. More nice features: Stainless steel strainer rims on the lids for easy straining, oven safe up to 350° F, dishwasher safe and a limited lifetime warranty. See more details and reviews of the Wearever Cook & Strain Stainless Steel 10-Piece Cookware Set at Amazon.com. The Cuisinart 77-7 Chef’s Classic Stainless Steel Cookware Set includes 1-1/2 quart and 3-quart saucepans, an 8-quart stockpot and a 10-inch skillet. Each piece has its own stainless steel lid. Each pot or pan has a stay cool, stainless steel handle and a dripless rim. The Cuisinart Chef’s Classic Cookware Set is made of durable, mirror finished 18/10 stainless steel. It has an encapsulated aluminum base to ensure quick and even heat distribution. Other pluses: Dishwasher safe, oven safe up to 550° F and carries a limited lifetime warranty. See more details and reviews of the Cuisinart 77-7 Chef’s Classic Stainless 7-Piece Cookware Set at Amazon.com. The T-Fal C811SA64 set includes 8″ and 10-1/4″ saute pans, 1 and 2 quart covered saucepans, a 5 quart Dutch Oven plus a spoon and slotted turner. Each piece has strong, riveted handles that stay cool to the touch. This set is dishwasher safe and can be used with induction cook tops, as well as traditional gas or electric stoves. See more details and reviews of the T-fal C811SA64 Elegance Stainless Steel Dishwasher Safe Cookware Set at Amazon.com. The Cook N Home set includes a covered 1-1/2 quart sauce pan, 1-1/2, 2 and 3 quart covered casseroles, 5-1/2 quart covered stock pot and 10″ frying pan with a lid. The set is made of 18/0 stainless steel polished to a mirror finish. It is suitable for all gas and electric cooking surfaces and a few customers report it works fine with induction cooktops, too. 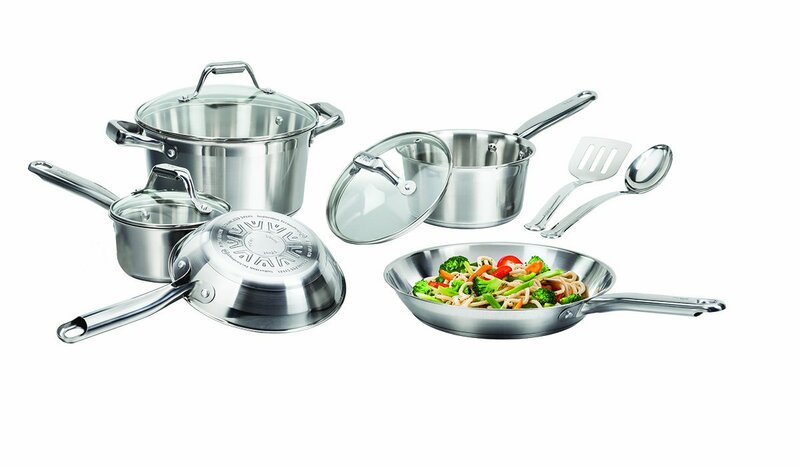 See more details and reviews of the Cook N Home 12-Piece Stainless Steel Set at Amazon.com. The Wyndham House 12 piece set includes 1.5 quart, 2.25 quart, 3 quart and 6 quart covered sauce pots, a 1.5 quart covered saucepan, and a 10-1/8″ covered fry pan. All of the pots and pans have encapsulated bottoms for even heat distribution, with less chance for hot spots. 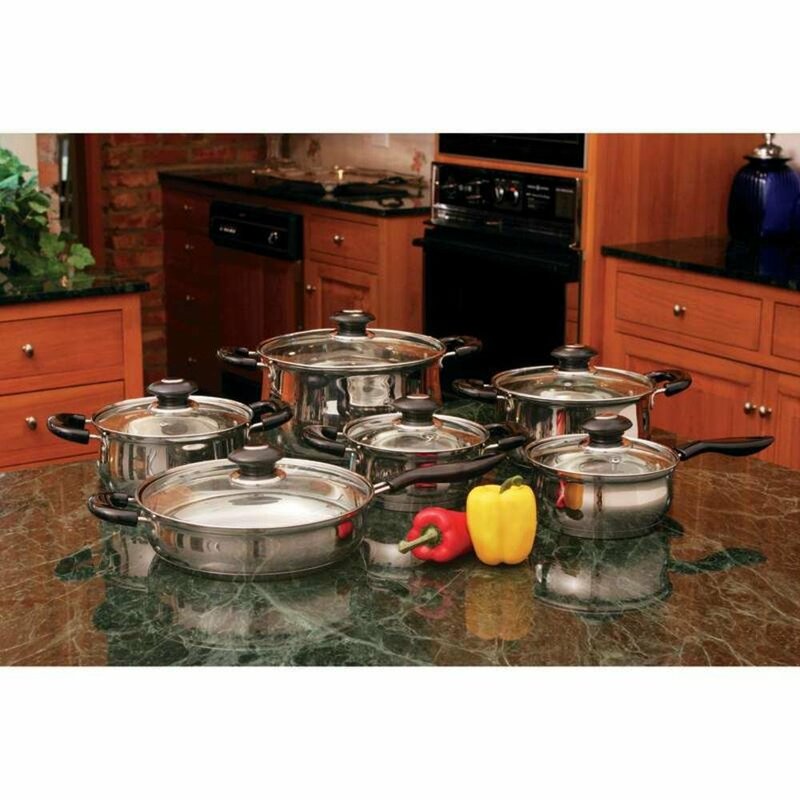 The mirror polished stainless steel Wyndam House cookware set is completely dishwasher safe. The set comes gift boxed – perfect for a wedding gift or first time home owner gift. Other features: Has a limited lifetime warranty. See more details and reviews of the Wyndham House 12 Piece Stainless Steel Cookware Set at Amazon.com.